A study concludes that most breast cancers are caused by mutations in 30 to 50 genes. One of the key findings is that many of the newly discovered breast cancer mutations are put specifically in the four individual established breast cancer subclasses. The study “Comprehensive molecular portraits of human breast tumours” was published in the journal Nature. The authors of the study Cancer Genome Atlas Networks, a large consortium of mainly US-based research groups, have studied tumour cells and control germline cells from 825 patients with a large number of molecular high-output processes. Collected items include mRNA expression data, information on DNA methylation and on DNA point mutations. Further, microRNA and the complete exome was sequenced and the expressions of certain proteins was measured. For 348 tumours, data was ultimately available from all the techniques used. The results indicate a very heterogeneous disease, only three genes (TP53, PIK3CA and GATA3) were mutated in ten percent or more of all tumours. Breast cancers can be divided clinically into three therapeutic groups. ER-positive tumours respond to hormone antagonists. 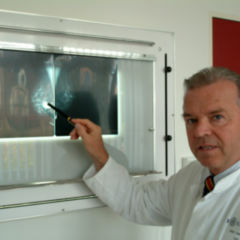 Breast cancer cells in which multiple copies of the HER2 gene are found can be treated with antibodies. A third class that lacks these markers is in a group where treatment is dependent on chemotherapy. This classification was in the last years able to be extended via gene expression analysis to four subtypes. These four types differ primarily in terms of their prognosis and the treatment to which they respond. The four molecular classes were then able to be confirmed through the present study and to be refined. Luminal A tumors were, with a share of 44 percent, the most frequently occurring breast cancer in the study. These cancer cells have an above-average number of oestrogen or progesterone receptors on their surface. Therefore these tumours respond very well to anti-hormonal therapy. Where there is a low level of proliferation, it is assumed that luminal-A is present. Luminal B tumours were represented in the study as a share of 24 percent, the second most frequent. They are characterised by high proliferation. Therefore, in addition to endocrine therapy, with this type chemotherapy is also recommended. 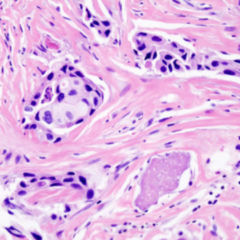 Basal-like tumours followed in third place with a figure of 19 percent. They respond neither to anti-hormonal nor to an anti-HER2 therapy. Therefore they are also labelled as triple negative. The new study shows that the genetic changes in these tumours resembles the serous-papillary cystadenocarcinoma, a particular form of ovarian cancer. The analysis showed that both forms of cancer can be treated with drugs that hinder the growth of new blood vessels. HER2-enriched tumours were identified in eleven percent of the cases. These are cancer cells which have many docking sites for a specific growth factor. In the genetic analysis it was revealed that among HER2-positive tumours there can be major differences and therefore they are classified by the researchers into two groups: one group can be considered HER2-enriched, the other would actually belong to the luminal group. That means the former group is responsive to therapy directed at HER2, the latter is not. Finally, a fifth type of breast cancer was identified as “normal-like” (2%). Since within the current study only eight of the tumours examined were of this type, the researchers were unable to yield any precise details on this. “We have now via our study taken a major step in understanding the genetic basis of the four main forms of breast cancer”, says study leader Matthew Ellis of Washington University School of Medicine in St. Louis. Thus the cataloging of almost all genetic mutations in breast cancer has been completed. “Now we can, based on the genetic profile of the tumour, study which drugs are most effective for breast cancer patients”, stresses Ellis. “Perhaps in the future we will be able to make prognoses with it in more detail as to which women could be spared chemotherapy”, adds Prof. Matthias W. Beckmann, director of the Women’s Hospital at the University of Erlangen. Before these findings can be used in clinical practice, however, further studies are needed which will consume years before their completion. Doctors currently decide on the basis of the size of the tumour, the type of cells and the number of infected lymph nodes on the treatment method. An important role is played by markers in tumour tissue, through which predictions are made as to how fast the cancer is growing, and in view of which the selection of the medication or chemotherapy to be employed is made. What is also tested is whether the cancer cells have binding sites for oestrogen and progesterone, and one looks for HER2 receptors that bind to growth factors. The marker Ki-67 is also identified. The more cells they occur in, the more rapidly these divide. On the basis of these factors, individual treatment is determined. Currently, breast cancer is often operated on, whereby in 80 percent of cases the entire breast is not removed, only the tumour. This is followed by radiation, then chemotherapy. If hormone receptors are found in cancer cells, in addition an anti-hormone therapy is recommended. 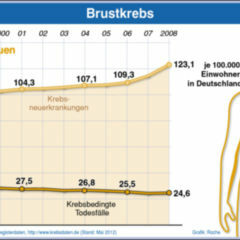 According to the WHO every year worldwide about 1.3 million people are diagnosed with breast cancer, 450,000 of them die; in Germany 72,000 new cases are diagnosed each year and 17,000 people die of breast cancer. 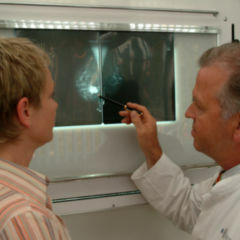 Although men can get breast cancer, more than 99 percent of sufferers are women. In 2006 cancer geneticists at U.S. genome centres and the British Sanger Institute initiated a 100 million dollar project with the aim of decoding defective genetic tissue of tumours. The Cancer Genome Atlas (TCGA) is to incorporate all genetic defects from all known cancers. In late 2008, the International Genome Consortium was established with the participation of 22 industrialised countries. First, the cellular functions of the 50 major tumour types would be completely deciphered. The goal is to get to know the proteins that the body produces via pathologically altered genes in order to be able to ultimately, through target means, block them. Further, predictions about the progress of the cancer would be created. Thirdly, one might be able to determine whether an individual patient, due to his or her genetic code, may respond to a specific form of treatment. With this goal in mind, within ten years 500 samples of diseased and healthy tissue should be analysed for each of the 230 known types of tumor. The first results of the research efforts have already been published: the genomes of a breast cancer and a leukemia patient, for each respectively as a comparison between the cancer cell and the healthy cell in the body, have already been made public.